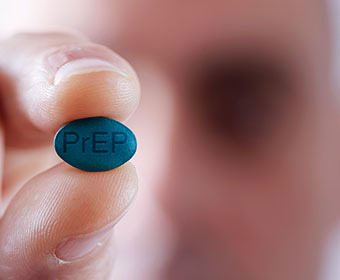 New study explores social perceptions of HIV-prevention drug, PrEP. (May 9, 2018) -- A new study led by a UTSA researcher examines the social perceptions of Pre-Exposure Prophylaxis (PrEP), a medication to prevent HIV, among gay and bisexual men in Texas. In addition to revealing racial disparities in PrEP perceptions, the research suggested that access to PrEP is limited for racial and ethnic minorities. According to the research, Schnarrs believes minorities may lack access to the medication due to limited knowledge of PrEP, financial barriers, language barriers and/or lack of insurance coverage. Schnarrs added that this research collaboration will be ongoing. Schnarrs collaborated on the study with researchers from the UTSA Department of Sociology, UTSA Institute for Health Disparities Research, South Texas Consortium for HIV & STI Research, University of Texas School of Public Health, San Antonio AIDS Foundation, University of California, San Francisco Department of Epidemiology, Center for HIV Educational Studies and Training in New York, Department of Psychology at Hunter College in New York and Austin PrEP Access Project. The study was funded by the UTSA College of Education and Human Development Faculty Research Grant. Schnarrs’ research has largely focused on health promotion and addressing health issues facing LGBTQ+ populations. He also researches how the LGBTQ+ population copes with discrimination and stigmas. Last year, Schnarrs was selected as a fellow in the Interdisciplinary Research Leaders Program, led by the University of Minnesota with support from the Robert Wood Johnson Foundation. During the three-year program, Schnarrs along with Amy Stone, associate professor of sociology and anthropology at Trinity University, and Robert Salcido from Pride Center San Antonio and Equality Texas, will study resilience in the LGBTQ+ populations in San Antonio and South Texas. The UTSA professor is involved with several groups focused on uplifting LGBTQ+ individuals. In 2013, Schnarrs co-founded UTSA’s LGBTQ Faculty and Staff Association, to provide a social support system for the campus community. In 2017, he became a board member of OUT Youth, a statewide advocacy organization in Texas focused on LGBTQ+ youth and young adults. As a learning and research enterprise, UTSA fosters innovation and creative discovery by channeling its expertise into tackling critical societal issues of today and tomorrow. The UTSA College of Education and Human Development is a national and international model in innovative teaching practices, health professional development and binational/bicultural issues. Read the UTSA study, recently published in AIDS and Behavior. Learn more about Phillip Schnarrs. Learn more about UTSA Department of Kinesiology, Health and Nutrition.